Have a Giantex/Costway twin tub washer that needs troubleshooting? 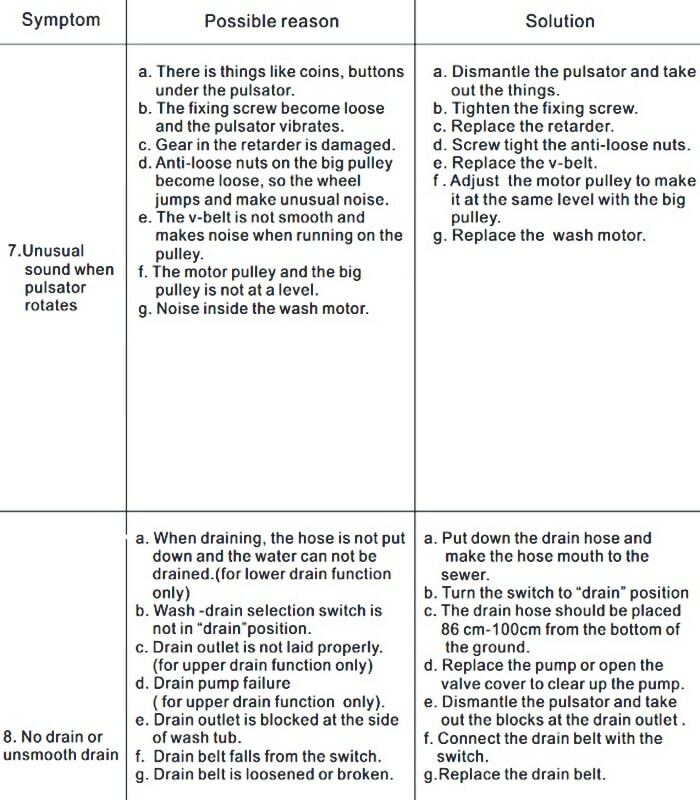 Here is a guide on specifications, how to use the washer properly, and troubleshooting methods. 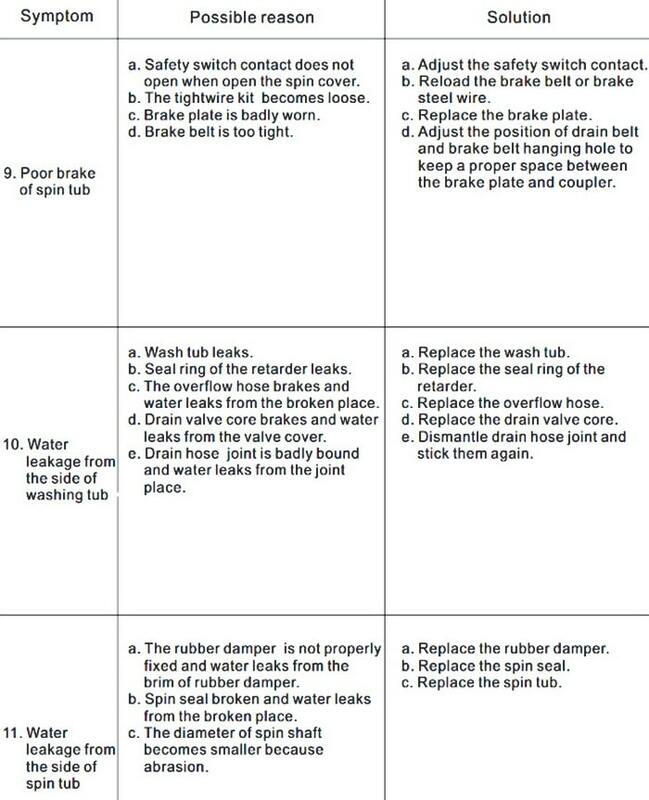 We have rewritten the HOW TO USE direction manual to help you better understand how to use the twin tub washer. 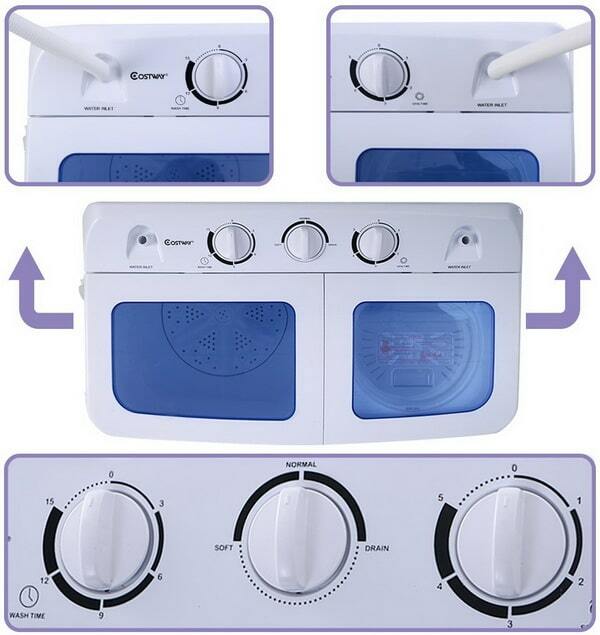 There are some common questions and answers on how to operate the Costway twin tub washer. 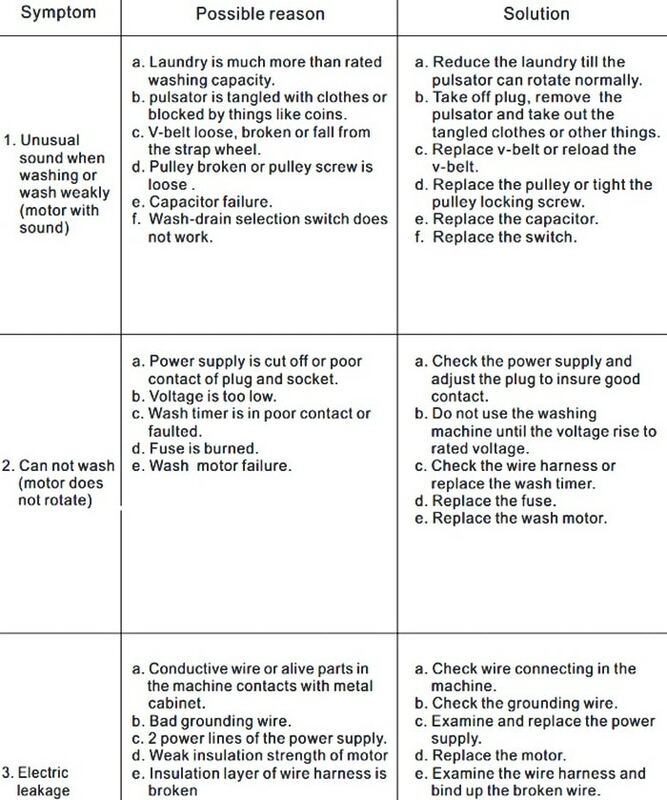 Troubleshooting and flowcharts are also shown below so you can fix the washer yourself. If you have any questions about your twin tub washer, please leave a question below and we will be happy to assist. How do you properly use a Giantex/Costway twin tub washing machine? Can you run both, the washer and the dry spin at the same time? Yes you can use both sides at once. Left side is washer and right side is a spin compartment to get most of water out of clothes. What are the best ways you for elevating it if you don’t put it directly in the tub? Purchase a PVC foot locker and place the machine on top of it then drape the hose into the tub. Use the styrofoam base it came with. It will add a more height and stability to the machine. How dry does the spin dryer get the clothes? Do you need to purchase a dryer as well? The clothes do spin dry, but I use my dryer just to fluff and take any excess lint off the clothes. Will this hook up to a regular 3 prong American wall socket? Yes it plugs right into a regular American wall socket. Is this on wheels and is the dryer part ventless? No wheels – It is lightweight – Not heavy when empty. One of the tubs is for washing the other tub is for spinning the excess water from the clothes. The washer doesn’t have a pump to drain it, it drains by gravity. -This is the portable mini compact with twin tub washing machine. -Preferred for doing laundry in a compact environment. -Perfect For dorms, apartments, condos, motor homes, RV’s, camping and more. -The total capacity of laundry is washer: 11lbs and spinner 6.6lbs. -The washing timer can be controlled up to 15 minutes. -The spin timer can be controlled up to 5 minutes for each load. -This washing machine has 1300 RPM motor with a voltage frequency of 110V/60HZ. -When you turn on the water you have to stay by the washer to watch it because it does not stop filling with water by itself. 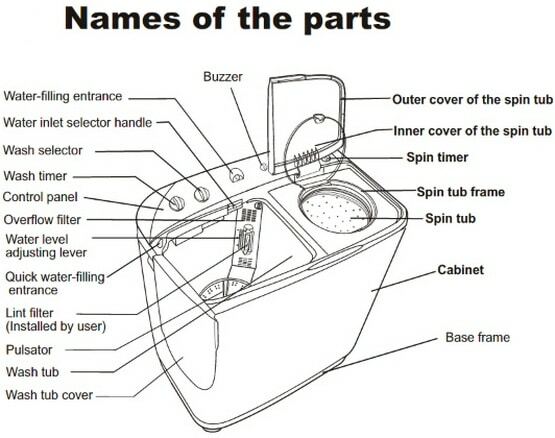 If you have any questions about your twin tub washer, please leave a question below and we will be happy to assist. Hello! My spinner tub is not draining at all and therefore not spinning properly. However, the washer drains just fine. 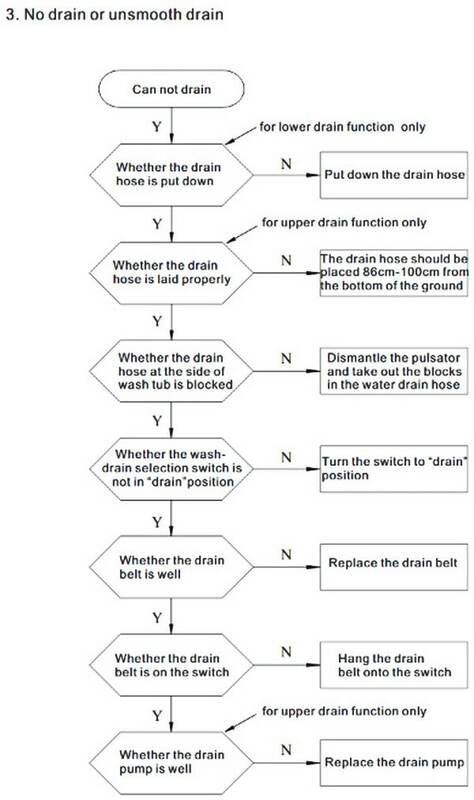 Where should I check for a clog or blockage that would effect only the spin side? Where can I find a replacement drain hose after a few uses it has developed a crack in the hose near the base of the washer. The pulsator is uneven and leaving holes in my clothes. When i remove it, it has one area that is missing plastic which may be causing the unevenness. There were 2 washers underneath it on the bolt that it sits on, not sure if there should only be one? The drain hose has a small tear in it and waterproof sealer did not work. Also, right away the disc used in the spinner went too high to the top and got ripped by friction. How can I replace these parts. The drain hose has lint that collected and wont come off with cleaning anyway. I was using my washer in the tub and forgot that I left water running. I think the motor got wet. The washer is not working now. Is it the motor? When I wash clothes, my COSTWAY GIANTEX washing machine makes a loud noise when it is spinning the clothes in the washing part. I am not sure why it does that. What can I do to fix it? 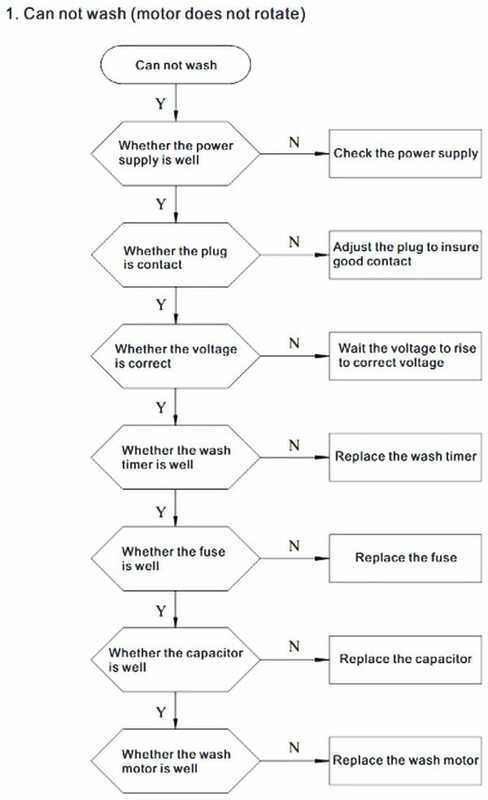 Hello, I’m trying to locate the fuses on the Costwat washing machine model XPB45-EP23103. The agitator has stopped working. 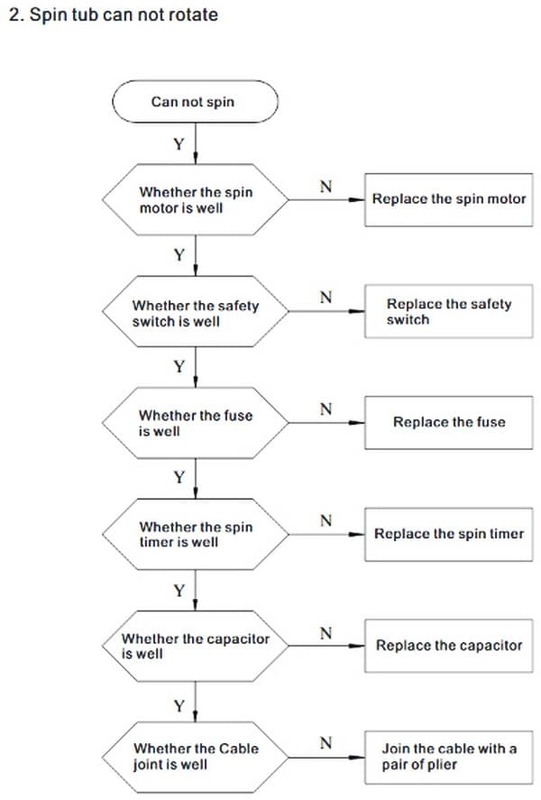 Where is the fuse located so I can try and fix my machine? Need to purchase drain pump for my costaway twin tub portable washer – model ep22931 – when it spin dries it doesn’t drain But the wash side of the tub does drain. 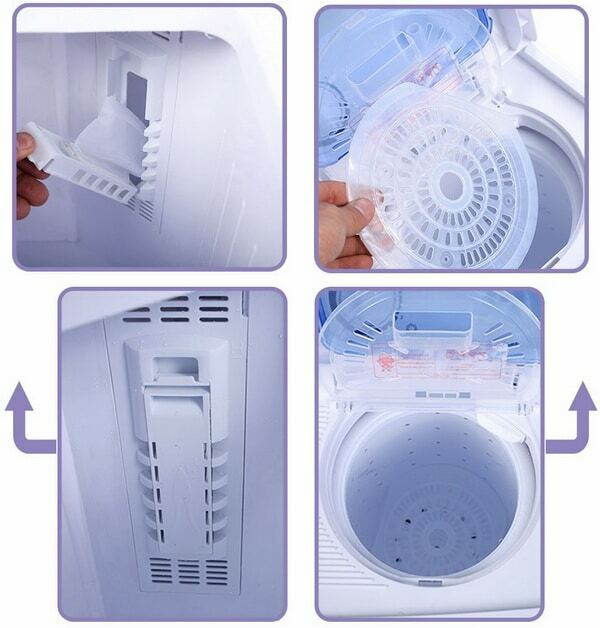 I was just wondering what the water inlet on the spinner side was for, can you add water while the clothes are spin drying? I’m sure it’s not there for no reason… but I have yet to see a video or instruction saying to add water to the spin dryer side. If you did not use too much soap (seems most peeps do) cloths should be perfect. I have a Costway Giantex – washer and spinner. The spinner motor is sounding rough and not spinning as fast as it used to spin. I am looking for instructions on how to open up the back/bottom and check the motor, etc. but can’t find any diagrams. 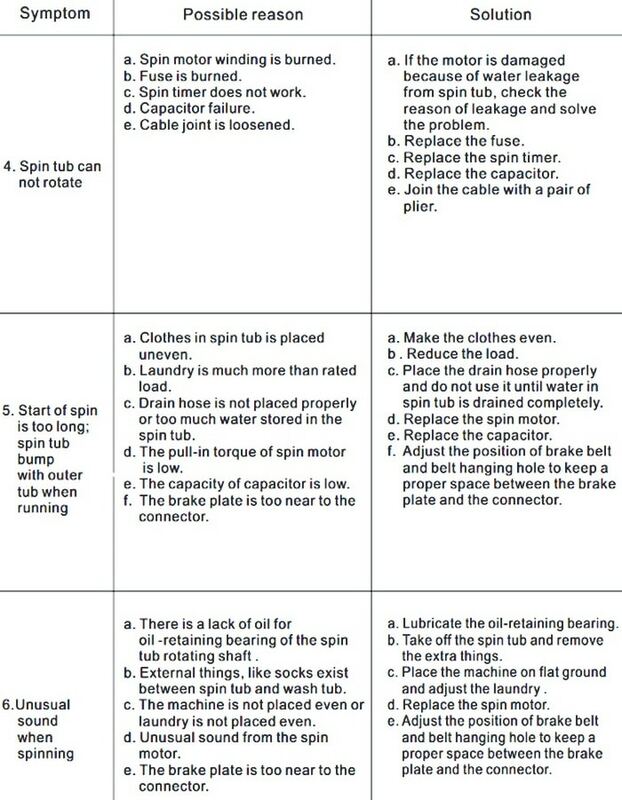 How do I open up the washer/spinner to fix/check anything or add oil? Hello, I have one of this twin tubs. But suddenly every time I plugged it in the dry spinner is on… it doesn’t turn off.. I tried to turn it off but couldn’t do it. Please I need some advise or solution to this problem. I purchased the Model EP22930. The directions say to connect the water inlet hose to the machine. I received only 1 very short hose that does not reach my sink for water. I would also like to know if I use the same hose for draining the water out. Please advise as to what is the best hose to purchase to use as the water inlet hose. I purchased the Costway washing machine model no. Ep23103 less than a week ago. The spin dryer is making noise and not spinning properly. I opened it up and at the bottom there’s thick yellow and black oil spilled all over the bottom. I am in the same situation. I have bought three washers like this, and this happened to each one. This one worked once, and I was delighted. Took it out to use it again, and only the timer is operational. If you find a solution, please let me know. If I find one, I’ll do the same. And I have the same problem. I just got my new machine a week ago. I washed two small loads and totally fell in-love with this machine. Today, I placed a third small load to wash and neither the agitator or spinner would move. There is a ticking noise, so the timer is working, but no movement at all. I’m so bummed. I so wanted to love this adorable little machine. The electrical cord has been chewed by our pet. Is there a way to replace it? I cannot locate parts for this machine. The machine works great, sadly the cord is shredded. My spin tub snapped off the frame and it’s new. How can I replace it? The top ring on the spin basket came off. How do I replace it? It comes right back off when spinning. The wash timer is not working. I can wash clothes as long as I hold timer. Have you replaced or fixed this problem yet? Mine will not set when turned just pops right back to 0 and it wont even start if i hold it.